One of the best way to sample the different styles of food that San Sebastián has to offer is to go for pintxos. It can be fun and delicious. Here we include some clarifications about this activity which you may also find useful if you go bar-hopping in the old part of town in the evening. “Poteo” is the local name of a traditional form of drinking (and eating) going from one bar to another in groups of around 5 to 15 friends (called “Cuadrilla”). It is the most popular and enjoyable form of socializing in the Basque Country and bars are perfectly adapted for this tradition. 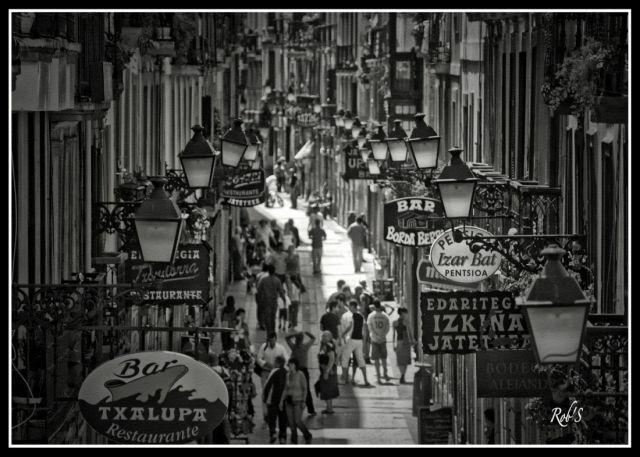 Roughly speaking tradition mandates that only one short drink should be taken on each bar accompanied by a small piece of food called “pintxos” and paid by a collective pot (called “bote”). 1. Make groups of 5-10 people (we recommend to keep the groups relatively small because things will get complicated if bigger). It is recommended to have at least one Spanish speaker in each group. 2. Pay 10€ each and choose someone in charge of the “Bote” (the pot). 3. Choose a representative that keeps the “Bote” with her, orders drinks and coordinates the ordering of Pintxos. Zurito: is the name of a very small glass of beer (those coming from a beer-culture country should not expect much from it). Red wine: called “Tinto” in Spanish or “Beltz” (black) in Basque; it is perhaps the most traditional drink for a poteo. You can order a “Txikito” (small in Basque), which is equivalent in size to a Zurito. Types of red wine: “Crianza”: a young, fresh and light, “Reserva”: full-bodied, older and a more expensive. Txakoli: it is a white and fresh Basque wine. Sidra: cider, it is very popular in the Basque Country. Mosto: grape juice for those that don’t drink alcohol (water, coke, apple juice, etc. can also be ordered). NOTE: the quantities will be small, don’t get surprised, prices will be equally low. Remember: the idea is just to have a small drink+food and move on; there will be plenty of opportunities in the next bar. 5. You will see Pintxos as soon as you get into the bars, they are small pieces of food, often very sophisticated, don’t spend too much time trying to guess what they contain, try them! They will have a price around 1-3€ each. A nice option is to ask the barman/woman to give you a plate with one Pintxo per person with a choice of her own. Yes, it is a temptation to eat many Pintxos in the same place, but keep in mind that you will move on to the next one, which also has very, very nice Pintxos! There are often hot Pintxos prepared on demand, these are slightly more expensive but often delicious. Check the boards displayed in the bars. 6. When ordering food and drinks it is important to keep it simple and efficient: choose a person in charge, she should remember what everyone is drinking (if you stick to your favorite drink you will make it simple to remember), when you order the drink tell the barman/woman that you are also going to take the same amount of pintxos as drinks and ask the members of your Cuadrilla to choose one each, make it evident that you are part of the group and pay. Right after move away from the bar so that other groups can come in and choose pintxos and order drinks. Drinking and eating outside the bar in the street is also a regular practice. 7. If the pot is empty, it is time to decide if you are going to go for another round and how much money you want to spend next. It is also the time to leave if you are tired or join a different group. IMPORTANT NOTE: Barmen and Barwomen can get stressed with foreigners because the art of “poteo” is complex. 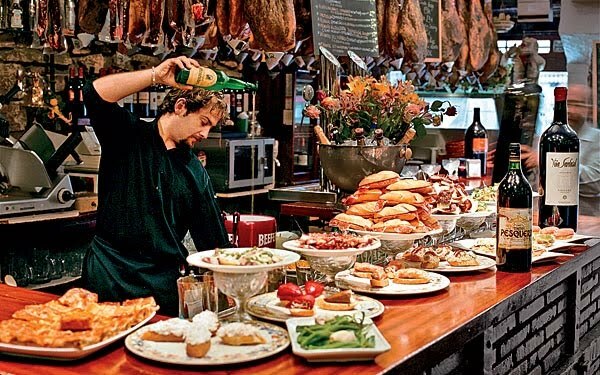 Locals do respect a number of non-written rules but avalanches of tourists taking Pintxos often create misunderstanding and potential conflict. You will see that Pintxos are accessible to anyone and that barwomen and men will keep an eye on who takes what, but they will rely on your honesty when it comes to pay for them so be kind and responsible when it comes to say how much your Cuadrilla has eaten and drunk. The best way to avoid problems is to pay as soon as the order is delivered and Pintxos are taken (by the same person that pays). It is also very important that you signal the barwomen/men that you are taking a Pintxo and tell her who will pay for it. Be nice and patient. VEGETARIANS: Vegetarians will have a difficult but potentially nice time with Pintxos. Unfortunately, most Pintxos have meat or fish on them. Mushroom and cheese are your main options and if you are lost ask for Pintxo de Tortilla (it is a very typical potato omelette, delicious! ).